Paul Kahan never wanted to write a cookbook just for the sake of it. Nor was he keen on the idea of a book that framed him as the sole driving force behind The Publican, his almost decade-old European-inspired tavern, and a beloved Chicago institution. "I'm a huge underachiever," says Kahan, who is one of the city's most prolific restaurateurs. "I didn't want to be involved with a book and have it be in the cutout record bin like an afterthought." It wasn't until Cosmo Goss, The Publican's chef de cuisine and a Forbes 30 Under 30 star, helped Kahan define the scope that the restaurant's first ever cookbook, Cheers to The Publican, really took shape. It was intended to be about "the people who make us look good," Goss says. The stunning cookbook is an homage to their purveyors, and it also follows the expansion of Kahan's restaurant group across Chicago, looking at the dishes they've cooked along the way. The book will teach you how to recreate many of The Publican's most beloved dishes, like Ham Chop "in Hay," the Farm Chicken, and steaming bowls of mussels. But you're also given the secrets to one of its most impressive and underrated dishes: the pork pie. A "ridiculously hearty, quintessentially European peasant food," cold meat pies are popular across the pond, but not so much in the United States. 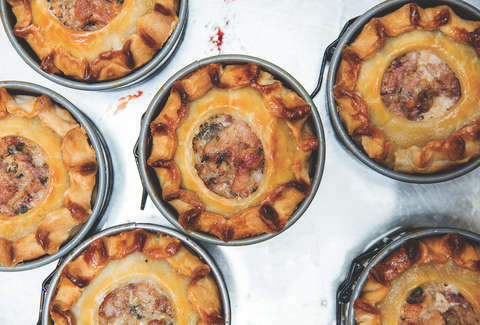 The Publican's pork pie recipe in particular came about years ago in piecemeal, first inspired by a vendor selling meat pies at a Chicago farmers market. "Sitting down with a pork pie and a pint of beer is as good as it gets." That lead Kahan and his former chef de cuisine, Brian Huston, down a YouTube rabbit hole of pork pie contest videos judged by British chef Fergus Henderson. After laughing through hours of YouTube clips, Kahan and Huston thought that "sitting down with a pork pie and a pint of beer is as good as it gets," Kahan recounts. "We were sort of on the same level. We thought that would just be the coolest thing ever." The final piece of the pork pie came together when the sous chef, Melba Ortiz, perfected the initial recipe into the hearty snack that is served at the restaurant today. "All the pictures [in the book] where you see the hands rolling out the dough, it's always Melba," Kahan says. "She's really the one that takes the things that we start and makes them 100 times better." "The joke is that if I died or Paul died, The Publican would still be fine," Goss says. "But if she died, like, we'd have to close. We couldn't figure out what to do." As for the recipe itself, don't expect the book to have an easy version for the homecook. It was important to Kahan and Goss to print them nearly identically to what the restaurant actually does. Otherwise, "people would make it and be like, 'Wait, this isn't what I had,'" Goss says. "I hate that feeling." And central to everything The Publican is about, seek out the best possible ingredients you can find. "We preach it through the whole book -- it's about the ingredients," Goss says. Don't settle for subpar pork or stale spices. Make the effort to find the Vulcan salt (a Tabasco sauce byproduct that you can buy online). Be patient; let the pastry and meat chill before handling and baking. The result will be meaty perfection. Test the mixture to see if it is well mixed: form a quarter-size piece and set it in a small pan. Place the pan in the oven and cook for 5 minutes, or until cooked through. Taste and add salt to the filling mixture, if needed. It should taste slightly salty since the flavor will be muted when served cold. Separate the filling into 4 equal pieces, form into balls, wrap in plastic, and refrigerate for 1 hour. To make the dough: In a small saucepan over medium heat, combine the butter, lard, and the 1∕2 cup water. When completely melted, remove the pot from the heat. Set aside. Add the flour to the bowl of a stand mixer fitted with the paddle attachment. Start the mixer on low speed and slowly add the butter-lard mixture. Continue to mix the dough for 3 minutes. Coat four 4-inch springform pans with a thin layer of cooking spray. Gently lay each rolled-out ball of dough in a pan, pushing the dough all the way down into the bottom of the mold and up the sides to extend about 1∕2 inch above the rim. Place a chilled pork ball in each mold and top each one with one of the pie lids. Then, using your thumb and forefinger, crimp together the edges of the bottom crust and lid pieces until the entire pie is completely sealed. Repeat for the other 3 pies. To make the egg wash: In a small bowl, whisk together the egg and water. Lightly brush the top of each pie with the egg wash. Place the pies on a baking sheet and bake for 3 hours, rotating the pies every hour. Set the pies on a cooling rack and let cool completely. Carefully pour 2 tablespoons of the headcheese-cooking liquid into each of the pork pies through the holes in the lids. Set aside to cool completely. Serve the pork pies cold with the mustard and pickles on the side. Cheers to the Publican, Repast and Present: Recipes and Ramblings from an American Beer Hall is available for purchase now. Leanne Butkovic is a features editor at Thrillist and a fan of cold, cold meats. Follow her on Twitter @leanbutk.